I was never a big fan of bagels. Back when I worked in Starbucks, bagels were items that were thrown out of our pantry because they quickly grew stale. And by stale, I mean rock hard. I’ve had my fare of eating stale bagel and I swore I’d never touch the damn thing after 10 a.m. It would take more than the help of an article writing service to convince me then how awesome bagels can get! However, a trip to the Big Apple and a strong recommendation of a friend prompted me to give it a try — especially when she’s actually pimping me a Zagat approved bagel: the best in New York. I arrived in Essa Bagel right smack in the middle of the breakfast rush. I stood outside the line, afraid to face the wrath of locals and started to plan what I wanted to eat. They had an extensive menu outside of cream cheese. Looking at their options made me feel that bagels were closer to sandwiches than just another kind of bread. 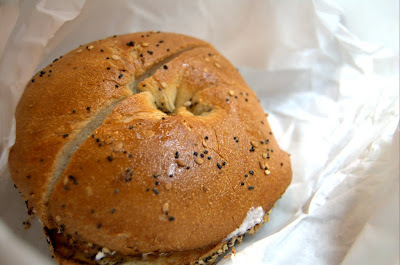 And true enough, listening to what people have been ordering, there is more to the bagel than just a bagel. The cheapest plain bagel costs $1.00 and with the add-ons, say… cream cheese and lox, it could go as high as $10.75. Ever heard of vegetarian cream cheese? It's never too late to try. 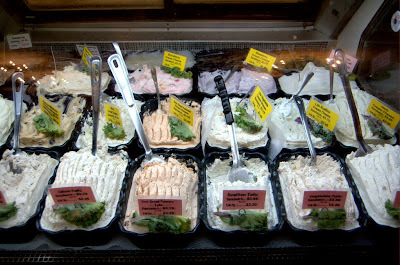 My friend suggested to me that if I had the luxury, the costly cream cheese and lox would be an experience. It was much too early in my trip for me to spend that much money hence, once the morning rush is over, I went in and order a great compromise: a toasted bagel with everything on it with lox cream. I have no idea what to order but I’ve been hearing a lot of people order “toasted everything.” Apparently what that meant was toasted bagel with every seed on top. My friend later told me that having an Essa Bagel toasted was a crime. However, did that change my opinion of the bagel? Toasted or not, if a bagel tastes great, then it’s bloody great. This bagel is Khursten approved! My bagel came with a lox cream filling — a cheaper compromise to the cream and lox bagel. Did it taste any cheaper? When my entire bagel was tickled pink with fillings, I honestly didn’t care whether I got the most expensive filling or not. The bagel tasted awesome. The crusty top with a chewy center was a galaxy away from my old killer bagels. And even when I felt that I couldn’t finish everything, 30 minutes later, I was licking my fingers clean. It was a glorious breakfast and a lovely welcome to New York. When I only have a day to experience the city, this New York minute with this lovely bagel is something definitely worth remembering. Oh damnit, I’ve been having a weird bagel craving for days and you post this! Gaaaaah!